Info "Draw a circle around the buttons to make 'em disappear. Don't draw a circle that's too big, or it'll fade away." In the Loop is a microgame found in the Ninja Scribble stage in WarioWare: Touched! 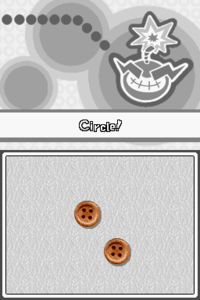 The objective of the game is to draw a circle around the buttons. Despite not requiring a lot of thinking, the player has eight seconds to do that. 1st level difficulty: The player must circle two buttons. 2nd level difficulty: The player must circle three buttons. 3rd level difficulty: The player must circle two moving buttons.